I’ll be going to [a coding boot camp]. [After I graduate], my current view is to try hard to negotiate for whatever I can and then get better for my second job, but both of those steps are based on the assumption that I understand what an acceptable range for pay, benefits, etc are, and I feel like it’s leaving money (or time) on the table. I’m not even sure if entry level jobs should be negotiated since they seem to be such a commodity. Do you have any advice for someone standing on the edge of the industry, looking to jump in? Don’t think of yourself as a commodity—you’re just undermining yourself. Don’t present yourself as a commodity—it’s bad marketing. You are not a commodity—because no one is. This is perhaps more obvious if you have lots of experience, but it’s just as true for someone looking for their first job. We all have different strengths, different weaknesses, different experiences and background. So when it comes to finding a job, you should be highlighting your strengths, instead of all the ways you’re the same as everyone else. In the rest of this article I’ll show just a few of the ways this can be applied by someone who is switching careers into the tech industry; elsewhere I talk more about the more theoretical side of marketing yourself. Since employment is a negotiated relationship, negotiation starts not when you’re discussing your salary with a particular company, but long before that when you start looking for a job. Here are just some of the ways you can improve your negotiating strength. If you’re going to a coding bootcamp chances are you’ve had previous job experience. Many of those job skills will translate to your new career as a software developer: writing software as an employee isn’t just about writing code. Whether you worked as a marketer or a carpenter, your resume and interviews should highlight the relevant skills you learned in your previous career. Those skills will make you far more competent than the average college graduate. This might include people management, project management, writing experience, knowing when to cut corners and when not to, attention to detail, knowing how to manage your time, and so on. And if you can apply to jobs where your business knowledge is relevant, even better: if you used to work in insurance, you’ll have an easier time getting a programming job at an insurance company. Research salaries in advance. There are a number of online salary surveys—e.g. StackOverlow has one—which should give you some sense of what you should be getting. Keep in mind that top companies like Google or some of the big name startups use stock and bonuses as a large part of total compensation, and salary doesn’t reflect that. Glassdoor has per-company salary surveys but they often tend to be skewed and lower than actual salaries. Imagine candidate A and candidate B: as far as the hiring manager is concerned they seem identical. However, if candidate B has another job offer already, that is evidence that someone elsewhere has decided they like them. So candidate B is no longer seen as a commodity. Try to apply to multiple jobs at once, and not to say “yes” immediately to the first job offer you can get. If you can get two offers at the same time, chances you’ll be able to get better terms from one or the other. In fact, even just saying “I’m in the middle of interviewing elsewhere” can be helpful. Notice how all of the suggestions above aren’t about that final conversation about salary. There’s a reason: by the time you’ve reached that point, most of the decisions about your salary range have already been made. You still need to ask for more, but there’s only a limited upside at that point. So it’s important to present your unique strengths and capabilities from the start: you’re not a commodity, and you shouldn’t market yourself like one. You’re looking for a new job, or feel like it’s time for a raise, or maybe you just want to set some boundaries with your boss. And that means negotiating, and you hate the whole idea: asking for things is hard, you don’t want to be treated specially, the idea of having the necessary conversation just makes you super-uncomfortable. And that’s a problem, because you can’t avoid negotiating: employment is a negotiated relationship. From the minute you start looking for a job until you leave for a new one, you are negotiating. And maybe you didn’t quite realize that, and maybe you didn’t ever ask for what you want, but in that case you’re still negotiating. You’re just negotiating badly. But once you internalize this idea, negotiation can get easier. That awkward, scary conversation where you ask for what you want is really just a small fraction of the negotiation. Which means if you do it right, that final conversation can be shorter, more comfortable, and much more likely to succeed. To see why, let’s take the example of a job search, and see how the final conversation where you discuss your salary is just a small part of the real negotiation. To simplify matters, we will specifically focus just on your salary as a programmer. Companies tend to have different job titles based on experience, with corresponding ranges of salaries. Your salary is determined first by the prospective job title, and second by the specific salary within that title’s range. The hiring manager reads your resume and refines that initial guess. The interview process then hardens that job title, and gives the company some sense of how much they want you and therefore where in that title’s salary range to put you. Finally, you get an offer, and you can push back and try to get more. That final step, the awkward conversation we tend to think of as the negotiation, is only the end of a long process. By the time you’ve reached it much of your scope for negotiation has been restricted: you’ll have a harder time convincing the company you’re a Software Engineer IV if they’ve decided you’re a Software Engineer II. You can choose companies to apply to where your enthusiasm will come across, or where you have highly relevant technical skills. You can get yourself introduced by a friend on the inside, instead of just sending in your resume. You can ensure you’ve demonstrated your correct level of problem-solving skills in your resume. If you can identify problems, it’s very easy to give the impression you can only solve problems if you don’t phrase things right (“I switched us over from VMs to Kubernetes” vs. “I identified hand-built VMs as a problem, investigated, chose Kubernetes, etc.”). You can interview for multiple jobs at once, so you can use a job offer from company A as independent proof of your value to company B. You can do well on the technical interview, which correlates with higher salaries. You can avoid whiteboard puzzles if you tend not to do well on those sorts of interviews. All of these—and more—are part of the negotiation, long before you get the offer and discuss your salary. Yes, you do need to ask for what you want at the end. And yes, that’s going to be scary and awkward and no fun at all. But asking for things is something you can practice in many different contexts, not just job interviews. But if you treated the whole job interview process as a negotiation, that final conversation will be much easier because the company will really want to hire you—and because they’ll be worried you’ll take that other job offer you mentioned. You’re not done negotiating when you’ve accepted the offer, though. When your boss asks you to do something, you don’t have to say yes. In fact, as a good employee it’s your duty not to say yes, but to listen, dig a little deeper, and find the real problem. Similarly, how many hours you work is not just up to your boss, is also about how you push back on unreasonable demands. And again, it’s your duty as a good employee to push back, because work/life balance makes you a better software engineer. Negotiation is far broader than just that awkward conversation where you make the ask. Being a good negotiator will make you a far more effective software engineer. There is a lot of code that overloads the __call__ method. This is the method that "calling" an object activates: something(x, y, z) will call something.__call__(x, y, z) if something is a member of a Python-defined class. The first use-case is easily done better with a named method, and more readably: accepting callbacks. Let's say that the function interesting_files will call the passed-in callback with names of interesting files. We can pass the matcher.get_name method, which is already callable directly to interesting_files: there is no need to make PrefixMatcher callable by overloading __call__. This uses the function closure to capture some variables and return a function. This uses the funcotools.partial functions to construct a function that has some of the arguments "prepared". There is one important use case for __call__, but it is specialized: it is a powerful tool when constructing a Python-based DSL. Indeed, this is exactly the time when we want to trade away "doing exactly when the operator always does" in favor of "succint syntax dedicated to the task at hand." A good example of such a DSL is stan, where the __call__ function is used to construct XML tags with attributes: div(style="color: blue"). In almost every other case, avoid the temptation to make your objects callable. They are not functions, and should not be pretending. JSON is a useful format. It might not be ideal for hand-editing, but it does have the benefit that it can be hand-edited, and it is easy enough to manipulate programmatically. For this reason, it is likely that at some point or another, checking in a JSON file into your repository will seem like a good idea. Perhaps it is even beyond your control: some existing technology uses JSON as a configuration file, and the easiest thing is to go with it. However, this does cause a problem: presumably, before, the list was formatted in a visually-pleasing way. Having dumped it, now the diff is unreadable -- and hard to audit visually. One solution is to enforce consistent formatting. redumped = json.dumps(content, indent=4) + "\n"
Assuming we gate merges to the main branches on passing tests, it is impossible to check in something that breaks the formatting. Automated programs merely need to remember to give the right options to json.dumps. However, what happens when humans make mistakes? A nice test failure will remind the programmer of this trick, so that it is easy to do and check in. Competing with a "Stanford grad just dying to work all nighters on Red Bull"
It seems like us software engineers are in a tough spot: companies demand a lot of hard work and long hours, and due to the competitiveness here in Silicon Valley, you have to go along with it (or else there’s some bright young Stanford grad just dying to work all nighters on Red Bull to take your place). But they throw you aside once the company has become established and they no longer need the “creative” types. The starting point is realizing that working long hours makes you a much less productive employee, to the point that your total output will actually decrease (see Evan Robinson on crunch time). If you want to become an effective and productive worker, you’re actually much better off working normal hours and having a personal life than working longer hours. Since working shorter hours makes you more productive, that gives you a starting point for why you should be hired. Instead of focusing on demonstrative effort by working long hours, you can focus on identifying and solving valuable problems, especially the bigger and longer term problems that require thought and planning to solve. Just because you’re a valuable, productive programmer doesn’t mean you’re going to get hired, of course. So next you need to find the right company. Level 1: These managers have no idea how to recognize effective workers, so they only judge people by hours worked. Level 2: These managers can recognize effective workers, but don’t quite know how to create a productive culture. That means if you choose work long hours they won’t stop you, however pointless these long hours may be. But, they won’t force you work long hours so long as you’re doing a decent job. Level 3: These managers can recognize effective workers and will encourage a productive culture. Which is to say, they will explicitly discourage working long hours except in emergencies, they will take steps to prevent future emergencies, etc.. When you look for a job you will want to avoid Level 1 managers. However good your work, they will be happy to replace you with someone incompetent so long as they can get more hours out of them. So you’ll be forced to work long hours and work on broken code. Level 3 managers are ideal, and they do exist. So if you can find a job working for them then you’re all set. Level 2 managers are probably more common though, and you can get work/life balance working for them—if you set strong boundaries. Since they can recognize actual competence and skills, they won’t judge you during your interview based on how many hours you’re willing to work. You just need to convey your skill and value, and a reasonable amount of dedication to your job. And once you’ve started work, if you can actually be productive (and if you work 40 hours/week you will be more productive!) they won’t care if you come in at 9 and leave at 5, because they’ll be happy with your work. Unlike Level 3 managers, however, you need to be explicit about boundaries during the job interview, and even more so after you start. Elsewhere I wrote up some suggestions about how to convey your value, and how to say “no” to your boss. To put all this another way: employment is a negotiated relationship. Like it or not, you are negotiating from the moment you start interviewing, while you’re on the job, and until the day you leave. Level 1 managers you can’t negotiate with, because what they want (long hours) directly conflicts with what you want. Level 2 managers you can negotiate with, by giving them one of the things they want: valuable work. Level 3 managers will give you what you want without your having to do anything, because they know it’s in the best interest of everyone. Of course, even for Level 3 managers you will still need to negotiate other things, like a higher salary. So how do you get a job with work/life balance? Focus on providing and demonstrating valuable long-term work, avoid bad companies, and make sure you set boundaries from the very start. Automated tests are immensely useful. Once you’ve started writing tests and seen their value, the idea of writing software without them becomes unimaginable. But as with any technique, you need to understand its limitations. When it comes to automated testing—unit tests, BDD, end-to-end tests—it’s tempting to think that if your tests pass, your software is correct. But tests don’t, tests can’t tell you that your software is correct. Let’s see why. Identification: Figure out what the problem is you’re trying to solve. Solution: Come up with a solution. Specification: Define a specification, the details of how the solution will be implemented. Implementation: Implement the specification in code. You might identify the wrong problem. You might choose the wrong solution. You might create a specification that doesn’t match the solution. You might write code that doesn’t match the specification. Automated tests are also a form of software, and are just as prone to error. The fact that your automated tests pass doesn’t tell you that your software is correct: you may still have identified the wrong problem, or chosen the wrong solution, and so on. From the code’s perspective—the perspective of an automaton with no understanding—the correct answer of 4 is the one that will cause it to fail. But merely by reading that you can tell it’s wrong: you, the human, are key. Correctness is something only a person can decide. While passing tests can’t prove correctness, the process of writing tests and making them pass can help make your software correct. That’s because writing the tests involves applying human judgment: What should this test assert? Does match the specification? Does this actually solve our problem? When you go through the loop of writing tests, writing code, and checking if tests pass, you continuously apply your judgment: is the code wrong? is the test wrong? did I forget a requirement? You write the test above, and then reread it, and then say “wait that’s wrong, 2 + 2 = 4”. You fix it, and then maybe you add to your one-off hardcoded tests some additional tests based on core arithmetic principles. Correctness comes from applying the process, not from the artifacts created by the process. This may seem like pedantry: what does it matter whether the source of correctness is the tests themselves or the process of writing the tests? But it does matter. Understanding that human judgment is the key to correctness can keep you from thinking that passing tests are enough: you also need other forms of applied human judgment, like code review and manual testing. So if correctness comes from writing the tests, not the tests themselves, why do we keep the tests around? Because tests ensure stability. once we judge the software is correct, the tests can keep the software from changing, and thus reduce the chances of its becoming incorrect. The tests are never enough, because the world can change even if the software isn’t, but stability has its value. Don’t mistake passing tests for correctness: you will likely need additional processes and techniques to achieve that. If you want to speak to me, 1-on-1, about anything, I want to be able to help. I am a busy person. I have commitments. But I will make the time to talk to you. I think I'll enjoy it. I like talking to people. I can offer opinions and experience on programming in general, Python, UNIX, the software industry and other topics. I am indebted to Robert Heaton for the idea and encouragement. Do you love programming for its own sake, or do you do for the outcomes it allows? Depending on which describes you best you will face different problems in your career as a software developer. Enthusiasts code out of love. 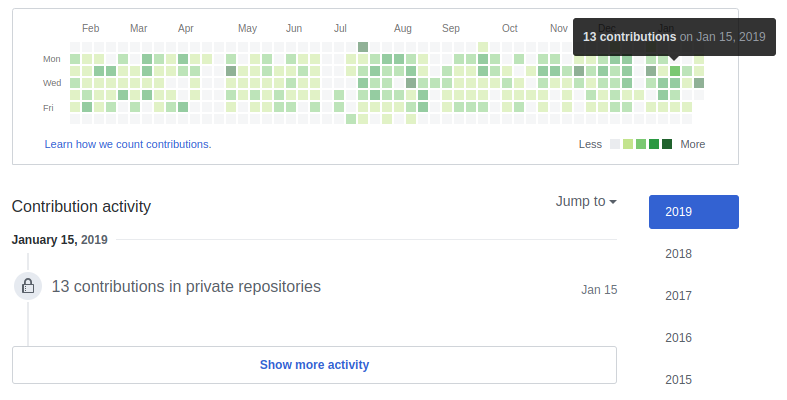 If you’re an enthusiast you’d write software just for fun, but one day you discovered your hobby could also be your career, and now you get paid to do what you love. Pragmatists may enjoy coding, but they do it for the outcomes. If you’re a pragmatist, you write software because it’s a good career, or for what it enables you to do and build. There’s nothing inherently good or bad about either, and this is just a simplification. But understanding your own starting point can help you understand and avoid some of the problems you might encounter in your career. Why many companies prefer to hire enthusiasts. The career problems facing enthusiasts, and how they can solve them. The career problems facing pragmatists, and how they can solve them. Before we move on to specific career problems you might face, it’s worth looking at the bigger picture: the hiring and work environment. In a rapidly changing environment, they’re more likely to keep up with the latest technologies. Even better, they’re more likely to do so in their free time, which means the company can spend less on training. Since they’d write software for free, it’s easier to pay enthusiasts less money. It’s also easier to get enthusiasts to work long hours. Finally, since enthusiasts care more about the technical challenge than the goals of the product, they’re less likely to choose their work based on ethical or moral judgments. But while many companies prefer enthusiasts, this isn’t always in the best interest of either side, as we’ll see next. So let’s say you’re an enthusiast. Here are some of the career problems you might face; not everyone will have all these problems, but it’s worth paying attention to see if you’re suffering from one or more of them. As I alluded to above, companies like enthusiasts because they’re worse negotiators. Long hours can lead to burnout, in which case you might not enjoy coding at all, even in your spare time. Less money reduces your options outside of work. Finally, you really shouldn’t do work that’s immoral or unethical: there are plenty of fun problems that won’t make you feel guilty. So even if you code for fun, you should still learn how to negotiate, if only out of self-defense. Shiny Object Syndrome: As an enthusiast it’s easy to choose a trendy technology or technique for your work because you want to play with it, not because it’s actually necessary in your situation. The most egregious example I’ve seen in recent years is microservices, where an organizational pattern designed for products with hundreds of programmers is being applied by teams with just a handful of developers. Writing code instead of solving problems: If you enjoy writing code for its own sake, it’s tempting to write more code just because it’s fun. Productivity as a programmer, however, comes from solving problems with as little work as needed. Finally, as an enthusiast you might face a constant sense of frustration. As an enthusiast, you want to write software for fun: solve interesting problems, write quality code, fine-tune your work until it’s beautiful. But a work environment is all about outcomes, not about craft. And that means a constant pressure to compromise your artistic standards, a constant need to work on things that aren’t fun, and a constant need to finish things on time, rather than when you’re ready. So unless you want to become a pragmatist, you might want to get back more time for yourself, time where you can write code however you like. You could, for example, negotiate a 3-day weekend. Pragmatists face the opposite set of problems; again, not all pragmatists will have all of these problems, but you should keep your eye out to see if they’re affecting you. Actively seek out companies that talk about work/life balance. When interviewing, amplify your enthusiasm for technology beyond what it actually is. After all, you will learn what you need to to get the results you want, right? Demonstrate the ways in which pragmatism actually makes you a more valuable employee. Actively seek out tasks, projects, or new jobs that will force you to learn new technologies on the job, in depth. Spend an hour every week gathering a broad but superficial knowledge of new technologies. Finally, you will often encounter pressure both from management and—indirectly—from enthusiast peers to work long hours. Just remember that working long hours is bad for you and your boss (even if they don’t realize it). So are you an enthusiast or a pragmatist? These are not exclusive categories, nor will they stay frozen with time—these days I’m more of a pragmatist, but I used to be more of an enthusiast—but there is a difference in attitudes. And that difference will lead to different choices, and different problems. Once you know who you are, you can figure out what you want—and avoid the inevitable obstacles along the way. By the time you get home from work and finish your chores you’re too tired to do anything but watch TV and then collapse into bed. And weekends are just as bad. But you could have a 3-day weekend not just on holidays, but every single week: learn how you can do it. The Conference That Was Almost Called "Pythaluma"
As my friend Thursday said in her excellent talk (sadly, not up as of this time) naming things is important. Avoiding in-jokes is, in general, a good idea. It is with mixed feelings, therefore, that my pun-loving heart reacted to Chris's disclosure that the most common suggestion was to call the conference "Pythaluma". However, he decided to go with the straightforward legible name, "North Bay Python". North of the city by the bay, lies the quiet yet chic city of Petaluma, where North Bay Python takes place. In a gold-rush-city turned sleepy wine country, a historical cinema turned live show venu hosted Python enthusiasts in a single-track conference. Mariatta opened the conference with her gut-wrenching talk about being a core Python developer. "Open source sustainability" might be abstract words, but it is easy to forget that for a language that's somewhere between the first and fifth most important (depending on a metric) there are less than a hundred people supporting its core -- and if they stop, the world breaks. Python is the new COBOL. I put a lot of pressure on him before his talk. Talks are still being uploaded to the YouTube channel, and I have already had our engineering team at work watch Hayley's post-mortem of Jurassic Park. Watch the videos. Maybe even mine. Sign up to the mailing list so you will not miss next year's. If you went there, I hope you told me hi. Either way, please say hi next year! You’ve got to meet your deadlines, you’ve got to fix the bug, you’ve got to ship the product. But you’ve also got to think about the future: every bug you introduce now will have to be fixed later, using up even more time. And all those deprecated APIs, out-of-date dependencies, and old ways of doing things really shouldn’t be there. So when do you clean up your code? Updating dependencies that are out-of-date and usages of deprecated APIs. Refactoring to fix bad abstractions. Miscellaneous Cleanups of anything else, from coding standard violations to awkward idioms. Before you start building something in earnest, you might start with a prototype (or what Extreme Programming calls a “spike”). You’re not going to keep this code, you’re just exploring the problem and solution space to see what you can learn. Given you’re going to throw away this code, there’s not much point in Updating or Miscellaneous Cleanups. And if you’re just trying to understand an existing API or technical issue, you won’t be doing much Refactoring wither. On the other hand, if your goal with prototyping is to find the right abstraction, you will be doing lots of Refactoring. Refactoring: now if you’re trying to prototype an API or abstraction, otherwise never. When you’re starting a completely new project, the decisions you make will have a strong impact on the maintenance code going forward. This is a great opportunity to start with the latest (working) dependencies, situation-specific best practices and maintainable code, and the best abstractions you can come up with. You probably won’t get them completely right, but it’s usually worth spending the time to try to get it as close as possible. You need to get a bug fix to users ASAP. While you might see problems along the way, but unless they’re relevant to this particular bug fix, it’s best to put them off until later. Sometimes that might mean fixing the bug twice: once in a quick hacky way, and a second time after you’ve done the necessary cleanups. When you have a project in active development and you’re doing ongoing work, whether features or bug fixes, you have a great opportunity to incrementally clean up your code. You don’t need to fix everything every time you touch the code. Instead, an ongoing cleanup of code you’re already touching will cumulatively keep your codebase in good shape. See Ron Jefferies’ excellent article for details. Updating: now, for code you’re touching. Refactoring: now, for code you’re touching. Miscellaneous Cleanups: now, for code you’re touching. Eventually your project will be finished: not much new development is done, and mostly it just gets slightly tweaked every few months when something breaks or a drop-down menu needs an extra option. Your goal at this point is to do the minimum work necessary to keep the project going. Refactoring and Miscellaneous Cleanups aren’t necessary, but Updates might be—dependencies can stop working, or need security updates. And jumping your dependencies 5 years ahead is often much harder than incrementally doing 5 dependency updates at yearly intervals. So whenever you have to do fix a bug, you should update the dependencies—ideally to Long Term Support releases to reduce the need for API usage updates. Updating: now, ideally to Long Term Support releases. Software projects tend to ongoing processes, not one-off efforts. A cleanup now might save you time later—but if you have a deadline to meet now, it might be better to put it off even at the cost of slightly more work later on. So takes this article only a starting point: as with any heuristic, there will be exceptions to the rule, and you need to be guided by your situation and your goals. Deadlines are hard to navigate. On the one hand you risk crashing into the rocks of late delivery, and on the other you risk drowning in a whirlpool of broken software and technical debt. And if you end up working long hours—if your only solution is crunch time—you risk both burnout and technical debt at the same time. Metaphorically, you risk drowning in a whirlpool full of fire-breathing rocks. Given too much work and not enough time, you need to say “no” to your boss and negotiate a better set of deliverables—but what exactly should you be aiming for? You could argue for maintainable, well-tested code, and deadlines be damned. But what if the deadline is important? Or you could argue for meeting the deadline no matter what, even if that means shipping untested or buggy code. But doesn’t the code need to work? This dilemma is a false dichotomy. Quality is situation-specific and feature-specific, and rote answers aren’t enough to decide on an implementation strategy. The real answer is to prioritize the work that really matters in your particular situation, and jettison the rest until after the deadline. And that means saying “no”: saying no to your boss, saying no to your customer, and saying no to yourself. No, all the code can’t be perfect (but this part needs to be rock solid). No, that feature isn’t important for addressing our goals. No, we can’t just add one small thing. But yes, we will do what really matters. Let’s consider two examples: the same task, but very different goals and implementations. I once worked at a startup that was starting to run out of money: our existing business was not working. Luckily, the co-founders had come up with a plan. We would pivot to a trendy new area—Docker was just gaining traction—where we could build something no one else could do at the time. Now, this meant were going to be building a distributed system, a notoriously difficult and complex task. And we had a deadline we had to meet: we were going to do a press campaign for our initial release, and that requires a few weeks of lead time. And of course on a broader level we needed to make enough of an impression that we could get funding before our current money ran out. How do you build a complex, sophisticated piece of software with a short deadline? You start with your goals. Our goal was to demonstrate the key feature that only our software could do. We decided to do that by having users walk through a tutorial that demonstrated our value proposition. If the user was impressed with our tutorial then we’d succeeded; we explicitly told users that the software was not yet usable in the real world. A production system would need to support parallel operation, but our tutorial only needed to be used by a single user. So we implemented the distributed system by having a CLI that SSHed into a machine and ran another CLI. A production system would need to handle errors, but our tutorial could run in a controlled environment. We created a Vagrant config that started two virtual machines, and didn’t bother writing error handling for lost connections, inaccessible machines, and so on. A production system would need to be upgradeable and maintainable, but our tutorial would only be run once. So we didn’t bother writing unit tests for most of it, and focused instead on manually running through the tutorial. Now, you might be thinking “but you’re choosing to abandon quality”. But again, none of the things we dropped were relevant to our goal at that time. Spending time on “best practices” that aren’t relevant to your particular situation is a waste of time. We were very clear in all our documentation and marketing efforts that this was a demonstration only, and that we would be following up later with a production-ready release. Even with these simplifications, we ended up dropping features to meet the deadline. How did we decide which futures to drop? We started by implementing the minimal features needed to demonstrate our core value, and so when we ran out of time we dropped the remaining, less critical features. We stopped coding before the drop date (a week or a few days, I believe), and focused just on testing and polishing our documentation. Dropping features was quite alright: the idea was good enough, the tutorial was compelling enough, and our VP of Marketing was skilled enough, that we were able to raise a $12 million Series A based off that unscalable, unmaintainable piece of software. And after the initial release and publicity push we had time to implement those later features to keep up our momentum. Once we had VC funding we rebuilt the product with the same set of features, but a very different goal: a production-ready product. That meant we needed a good architecture, an installer, error handling, good test coverage, and so on. It took much longer, and required a much bigger team, but that was OK: we had a different goal, and enough funding to allow for a longer deadline (again, based on publicity needs). Even so, we made sure to choose and prioritize our work based on our goal: getting users and customers for our product. Our initial prototype had involved a peer-to-peer storage transfer mechanism, and making that production ready would have been a large R&D exercise. So in the short term we focused on cloud storage, a much simpler problem. And we made sure to drop less important features as deadlines approached. We certainly didn’t do a perfect job, e.g. we dropped one feature that was half-implemented. We would have done better not starting it at all, since it was less important. But, we succeeded: the code was maintainable, people started using it, and we didn’t have to rely on crunch time to deliver. There is no universal solution that will work everywhere, no easy answers. All you can do is ask “why”: why are we doing this, and why does this matter? Drop features that don’t further your goals, and start with the most important features, in case you run out of time for the rest. And if you still have too much work, it’s time to have a discussion with your boss or customer about what tradeoffs they actually want. There’s always too much work to do: too many features to implement, too many bugs to fix—and working evenings and weekends won’t help. The real solution is working fewer hours. Learn how you can get a 3-day weekend. These are a few quick notes to self, rather than a cogent thesis. I want to get this out while it’s still fresh, and I want to lower my own mental barrier to publishing here. I’ve been thinking about test coverage recently, inspired by conversations that followed DRMacIver’s recent post. The justification is that “the test of all knowledge is experiment” . While we should absolutely make our code easy to reason about, and prove as much as we can about it, we need to check what it does against actual reality. Simple testing really can prevent most critical failures. It’s OK to not test some part of your code, but that should be a conscious, local, recorded decision. You have to explicitly opt out of test coverage. The tooling should create a moment where you either write a test, or you turn around and say “hold my beer”. Switching to this for an existing project can be prohibitively expensive, though, so a ratchet is a good idea. The ratchet should be “lines of uncovered code”, and that should only be allowed to go down. Don’t ratchet on percentages, as that will let people add new lines of uncovered code. Naturally, all of this has to be enforced in CI. No one is going to remember to run the coverage tool, and no one is going to remember to check for it during code review. Also, it’s almost always easier to get negative feedback from a robot than a human. I tagged this post with Haskell, because I think all of this is theoretically possible to achieve on a Haskell project, but requires way too much tooling to set up. hpc is great, but it is not particularly user friendly. Existing code coverage SaaS services don’t support expression-level coverage. As a bit of an experiment, I set up a test coverage ratchet with graphql-api. I wanted both to test out my new enthusiasm for aiming for 100% coverage, and I wanted to make it easier to review PRs. The ratchet script is some ad hoc Python, but it’s working. External contributors are actually writing tests, because the computer tells them to do so. I need to think less hard about PRs, because I can look at the tests to see what they actually do. And we are slowly improving our test coverage. I want to build on this tooling to provide something genuinely good, but I honestly don’t have the budget for it at present. I hope to at least write a good README or user guide that illustrates what I’m aiming for. Don’t hold your breath. Some commands have a --dry-run option, which simulates running the command but without taking effect. Sometimes the option exists for speed reasons: just pretending to do something is faster than doing it. However, more often this is because doing it can cause big, possibly detrimental, effects, and it is nice to be able to see what would happen before running the script. For example, ansible-playbook has the --check option, which will not actually have any effect: it will just report what ansible would have done. This is useful when editing a playbook or changing the configuration. However, this is the worst possible default. If we have already decided that our command can cause much harm, and one way to mitigate the harm is to run it in a "dry run" mode and have a human check that this makes sense, why is "cause damage" the default? As someone in SRE/DevOps jobs, many of the utilities I run can cause great harm without care. They are built to destroy whole environments in one go, or to upgrade several services, or to clean out unneeded data. Running it against the wrong database, or against the wrong environment, can wreak all kinds of havoc: from disabling a whole team for a day to actual financial harm to the company. For this reason, the default of every tool I write is to run in dry run mode, and when wanting to actually have effect, explicitly specify --no-dry-run. This means that my finger accidentally slipping on the enter key just causes something to appear on my screen. After I am satisfied with the command, I up-arrow and add --no-dry-run to the end. I now do it as a matter of course, even for cases where the stakes are lower. For example, the utility that publishes this blog has a --no-dry-run that publishes the blog. When run without arguments, it renders the blog locally so I can check it for errors. So I really have no excuses... When I write a tool for serious production system, I always implement a --no-dry-run option, and have dry runs by default. What about you? There’s always too much work to do: too many features to implement, too many bugs to fix. And working evenings and weekends won’t help. The real solution: you need to work fewer hours. You want to work on cutting edge technology, you want challenging problems, you want something interesting. Problem is, you also want work/life balance: you don’t want to deal with unrealistic deadlines from management, or pulling all-nighters to fix a bug. And the problem is that when you ask around, people tell say you need to work long hours if you want to work on challenging problems. That’s just how it is, they say. You can work on challenging problems and still have work/life balance. In fact, you’ll do much better that way. A component of the flight search product that now powers Google Flights (flight search is hard—my team was working on the stuff on slides 44-48). The prototype for what was then cutting edge container storage technology, a prototype that helped my company raise a $12 million Series A—and then we turned it into a production ready distributed system. A crazy/useful Kubernetes local development tool. Most recently, scientific image processing algorithms and processing pipeline. All of these were hard problems, and interesting problems, and challenging problems, and none of them required working long hours. There is no inherent relationship between interesting problems and working long hours. You’re actually much more likely to solve hard problems if you’re well rested, and have plenty of time off to relax and let your brain do its thing off in the background. The real problem that these companies are trying to solve is “how do I get as much work out of these suckers with as little pay as possible.” It’s an incompetent self-defeating strategy, but there’s enough VCs who think exploitation is a great business model that you’re going to encounter it at least some startups. The reality is that working long hours is the result of bad management. Which is to say, it’s completely orthogonal to how interesting the problem is. You can just as easily find bad management in enterprise companies working on the most pointless and mind-numbingly soul-crushing problems (and failing to implement them well). And because of that bad management you’ll be forced to work long hours, even though the problems aren’t hard. Luckily, you can also find good management in plenty of organizations, big and small—and some of them are working on hard, challenging problems too. So how do you avoid exploitative workplaces and find the good ones? By asking some questions up front. You shouldn’t be relying on luck to keep you away from bad jobs; I made that mistake once, but never again. At that point I realized that, while I was willing to exchange 40 hours a week for a salary, I was not willing to exchange my whole life. I escaped that company by accident because they were so blatant about it, but you can do better. When you’re interviewing for a job, don’t just ask about the problems they’re working on. You should also be asking about the work environment and work/life balance. There are companies out there that do interesting work and have work/life balance: do your research, ask the right questions, and you too will be able to find them. What if every weekend could be a 3-day weekend? Some Python projects are designed to be libraries, consumed by other projects. These are most of the things people consider "Python projects": for example, Twisted, Flask, and most other open source tools. However, things like mu are sometimes installed as an end-user artifact. More commonly, many web services are written as deployable Python applications. A good example is the issue tracking project trac. Projects that are deployed must be deployed with their dependencies, and with the dependencies of those dependencies, and so forth. Moreover, at deployment time, a specific version must be deployed. If a project declares a dependency of flask>=1.0.1, for example, something needs to decide whether to deploy flask 1.0.1 or flask 1.0.2. For clarity, in this text, we will refer to the declared compatibility statements in something like setup.py (e.g., flask>=1.0.1) as "intent" dependencies, since they document programmer intent. The specific dependencies that are eventually deployed will be referred as the "expressed" dependencies, since they are expressed in the actual deployed artifact (for example, a Docker image). Usually, "intent" dependencies are defined in setup.py. This does not have to be the case, but it almost always is: since there is usually some "glue" code at the top, keeping everything together, it makes sense to treat it as a library -- albeit, one that sometimes is not uploaded to any package index. When producing the deployed artifact, we need to decide on how to generate the expressed dependencies. There are two competing forces. One is the desire to be current: using the latest version of Django means getting all the latest bug fixes, and means getting fixes to future bugs will require moving less versions. The other is the desire to avoid changes: when deploying a small bug fix, changing all library versions to the newest ones might introduce a lot of change. For this reason, most projects will check in the "artifact" (often called requirements.txt) into source control, produce actual deployed versions from that, and some procedure to update it. A similar story can be told about the development dependencies, often defined as extra [dev] dependencies in setup.py, and resulting in a file dev-requirements.txt that is checked into source control. The pressures are a little different, and indeed, sometimes nobody bothers to check in dev-requirements.txt even when checking in requirements.txt, but the basic dynamic is similar. The worst procedure is probably "when someone remembers to". This is not usually anyone's top priority, and most developers are busy with their regular day-to-day task. When an upgrade is necessary for some reason -- for example, a bug fix is available, this can mean a lot of disruption. Often this disruption manifests in that just upgrading one library does not work. It now depends on newer libraries, so the entire dependency graph has to be updated, all at once. All intermediate "deprecation warnings" that might have been there for several months have been skipped over, and developers are suddenly faced with several breaking upgrades, all at once. The size of the change only grows with time, and becomes less and less surmountable, making it less and less likely that it will be done, until it ends in a case of complete bitrot. Sadly, however, "when someone remembers to" is the default procedure in the absence of any explicit procedure. Some organizations, having suffered through the disadvantages of "when someone remembers to", decide to go to the other extreme: avoiding to check in the requirements.txt completely, and generating it on every artifact build. However, this means causing a lot of unnecessary churn. It is impossible to fix a small bug without making sure that the code is compatible with the latest versions of all libraries. A better way to approach the problem is to have an explicit process of recalculating the expressed dependencies from the intent dependencies. One approach is to manufacture, with some cadence, code change requests that update the requirements.txt. This means they are resolved like all code changes: review, running automated tests, and whatever other local processes are implemented. Another is to do those on a calendar based event. This can be anything from a manually-strongly-encouraged "update Monday", where on Monday morning, one of a developer tasks is to generate a requirements.txt updates for all projects they are responsible for, to including it as part of a time-based release process: for example, generating it on a cadence that aligns with agile "sprints", as part of the release of the code changes in a particular sprints. When updating does reveal an incompatibility it needs to be resolved. One way is to update the local code: this certainly is the best thing to do when the problem is that the library changed an API or changed an internal implementation detail that was being used accidentally (...or intentionally). However, sometimes the new version has a bug in it that needs to be fixed. In that case, the intent is now to avoid that version. It is best to express the intent exactly as that: !=<bad version>. This means when an even newer version is released, hopefully fixing the bug, it will be used. If a new version is released without the bug fix, we add another != clause. This is painful, and intentionally so. Either we need to get the bug fixed in the library, stop using the library, or fork it. Since we are falling further and further behind the latest version, this is introducing risk into our code, and the increasing != clauses will indicate this pain: and encourage us to resolve it. The most important thing is to choose a specific process for updating the expressed dependencies, clearly document it and consistently follow it. As long as such a process is chosen, documented and followed, it is possible to avoid the bitrot issue. You’ve discovered you’re underpaid. Maybe you found out a new hire is making more than you. Or maybe you’ve been doing a great job at work, but your compensation hasn’t changed. Whatever the reason, you want to get a higher salary. To answer that question, the following guest post by Adrienne Bolger will explain how you can negotiate a raise at your current job. As you’ll see, she’s successfully used these strategies to negotiate 20-30% raises on multiple occasions. Researching your worth and options. Strategies that I have used—and helped others use—to ask for a raise. How much are you “worth”? At the end of the day, an optimized salary in a more-or-less capitalist market is the highest salary you think you can get that passes the “laugh test.” If you ask for a salary or bonus, and your (theoretical) boss or HR head laughs in your face, then the number is too high. Note that this number isn’t your laugh test number: many people, out of fear of rejection, are afraid to ask for a 25% raise rather than a more “modest” sounding 5% raise. But sometimes the 25% value is the right increase! Your number should not be based on fear: it should be based on research. StackOverflow calculator - I recommend starting with this one. Glassdoor calculator - this one will be helpful for engineers working at a company large enough that they can get their own company data from it. How much could you be worth in the future? Take the surveys a second time. However, this time, give yourself a small imaginary promotion: 2 years more experience and the next job title you want—Senior Engineer, Engineer II, Software Architect, Engineering Manager, Director, whatever it is. How far away is that yearly salary amount from the first one? A little? A lot? This is an important number, because the pay market for software engineers is not linear. Check out this graph created by ArsTechnica from the 2017 Stack Overflow salary data. This graph shows the economics of a very hot job market: people with relatively little experience still make a good living, because their skills are in high demand. 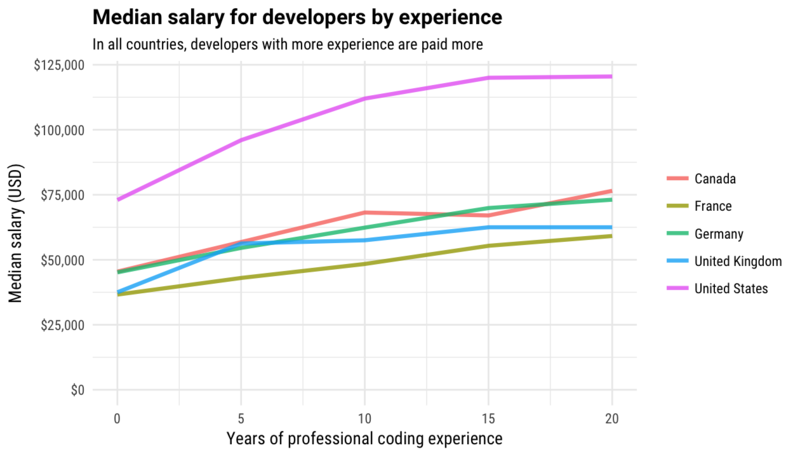 However, the median salary for a developer between 15 and 20 years of experience is completely flat. This isn’t the best news for experienced developers who haven’t kept learning (and some languages pay more than others), but for early career professionals, this external market factor is fantastic. With data to back you up, you can ask for a 20 to 30% raise after only a year or two on the job with a completely straight face. I did it in my own career at the 2 and 4 year marks at the same company, and received the raise both times. If you’ve come to the conclusion you are underpaid because you know what your colleagues earn, then you can skip this step. Otherwise, you have a little more research to do. Ask your company’s HR department and recruiters: when hiring in general, does your company go for fair market prices, under-market bargains, or above-market talent? Industries like finance pay better than non-profits and civil service organizations whether you are an engineer or an accountant. The bigger the company, the more likely you are to get standard yearly pay adjustments for things like cost-of-living expenses, but a bigger company is also likely more rigid in salary bands for a specific job title. HR at your company may or may not be willing to share the exact high and low range for a job title. If they are not, Glassdoor can provide a decent estimate for similarly size companies. Again, know your company. Does it have a standard financial cycle, with cost-of-living and raises allocated yearly 1-2 months after reviews are in? If so, time your “ask” before your formal review by 3-8 weeks. That might be November if your yearly reviews are in December, or it might be January if company yearly performance reviews occur in March, after the fiscal year results from last year are in. The problem with waiting until a formal review is scheduled is that is ruins plans you can’t see or are not privy to. Even in the best case where you were getting a raise anyway, the manager giving your review already has a planned number in their head and their accounting software. Asking a month beforehand gives your boss time to budget your raise into a yearly plan, which is much easier than trying to fight bureaucracy out-of-cycle. You should not ask for a raise more frequently than every 2 years. If you feel like you have to, then you probably didn’t ask for enough last time. Consider that if you find yourself afraid to ask for as much. If you are debating between asking for a raise and going job hunting because you feel undervalued, ask for the raise first. I suggest this because job searching is a huge time sink, especially if you don’t really want to change jobs. You owe it to yourself to proactively seek happiness. If what you really want is more money and to stay at your current company, then give your employer a chance to make you happy. If you ask and are denied, then at least you’ve done all the research into compensation when you go looking. Ask for a raise both in writing and in person. As email is still considered informal, this is one of those cases where an actual letter—printed out and hand-delivered to a scheduled meeting with your manager—is a good idea. The meeting gives the chance to explain what you want a little more, but the letter is a written record of what you want that goes to HR, as well as a way to keep yourself from backing out due to nerves or stress. I once requested a raise from a manager who (unbeknownst to me) was let go 2 weeks later. However, because my raise request was also in writing, I received the raise from my new boss with no confusion after the transfer. Be addressed and CC’d to your manager and HR at your company. List your current length of service with the company and affirm that you like working there. Detail exactly what you want: a 20% raise? A $5,000 raise? Tuition money for school? More vacation days? Do not leave it ambiguous. Do you have more experience now? Learn new skills or programming language? Has it been 3 years since you got a review because you work at a 20 person startup? The exception to the previous point is if you know you are underpaid because a coworker with the same responsibilities is paid more: it’s enough to say that in general terms. Calling a specific coworker out is unnecessary. List, in 2 sentences or less, any recent accomplishments that were especially impactful. This serves 2 purposes: reminding your boss how awesome you are, but also making it easy on them to justify your (deserved) raise to the people they are accountable to at the next level up in the company. End with a request for a meeting discussing the contents of the letter. Imply you will leave if you don’t get what you want, even if you are planning on it. Bluffing here is a good way to get asked to leave anyway. Even if you are planning to leave if you don’t receive a raise, threats put people on the defensive. Sound angry or imply you have an ungrateful or deficient manager/employer. Position yourself as asking for something a reasonable person should want to give you. Have the most gentle and peaceful individual you know read your letter to double check tone. If all else fails, try your local Buddhist monk. Once you ask for a raise and a meeting to talk about it, nerves may kick in. Do your homework ahead of time and come in prepared. Bring a copy of your letter and, during the meeting, re-iterate exactly what it is you want and why you deserve it. It’s fine to be nervous, but do not attempt any weird “Hollywood caricature of a car salesman” negotiating tactics. Don’t be short-sighted; remember that you have to perform your day job with your manager once the meeting is over. Be proactive in determining where the problem is. At a big company, if there’s a salary band, you may need a promotion before you can get the raise. If the company isn’t making enough money for raises for anyone, it may be time to discreetly look for another job anyway. Whether or not you choose to accept a compromise or counteroffer is up to you—but make sure that you can live with your choice, at least short term, because it won’t make sense to ask again for another few months. And that’s Adrienne’s post. I hope you found it useful: I certainly learned a lot from it. Of course, reading this article isn’t enough. You still need to go and do the work to get the raise. So why not start today? You’ve got plenty of work to do already, when your boss (or their boss, or the CEO) comes by and asks you to do yet another task. If you take yet another task on you’re going to be working long hours, or delivering your code late, and someone is going to be unhappy. You don’t want to say no to your boss (let alone the CEO!). You don’t want to say yes and spend your weekend working. What do you do? How do you keep everyone happy? What you need is your management to trust your judgment. If they did, you could focus on the important work, the work that really matters. And when you had to say “no”, your boss (or the CEO!) would listen and let you continue on your current task. To get there, you don’t immediately say “no”, and don’t immediately say “yes”. Start with your organizational and project goals. Communicate your decision in terms of organizational and project goals. If you want people to listen to you, you need a strong understanding of why you’re doing the work you’re doing. What is your project trying to achieve, and how does that connect to organizational goals? How does your work connect to the project goals? When you’re just starting out as an employee this can be difficult to do, but as you grow in experience you can and should make sure you understand this. (Starting with your goals is useful in other ways as well, e.g. helping you stay focused). Your lead developer/product manager/team mate/CEO/CTO had just stopped by your desk and given you a new task. No doubt you already have many existing tasks. How should you handle this situation? Don’t immediately say “yes”: Unless you happen to have no existing work, any new work you take on will slow down your existing work. Your existing work was chosen for a reason, and may well be more important than this new task. Don’t immediately say “no”: There’s a reason you’re being asked to do this task. By immediately saying “no” you are devaluing the request, and by extension devaluing the person who asked you. Instead of immediately agreeing or disagreeing to do the task, take the time find out why the task needs to be done. Make sure you demonstrate you actually care about the request and are seriously considering it. That means first, listening to what they have to say. And second, asking some questions: why does this need to be done? What is the deadline? How important is it to them? Sometimes the CEO will come by and ask for something they don’t really care about: they only want you to do it if you have the spare time. Sometimes your summer intern will come by and point out a problem that turns out to be a critical production-impacting bug. You won’t know unless you listen, and ask questions to find out what’s really going on. Is the new task more important to project and organizational goals than your current task? You should probably switch to working on it. Is the new task less important? You don’t want to do it. Not sure? Ask more questions. Once you’ve made a decision, you need to communicate it in a meaningful, respectful way, and in a way that reflects organizational and project goals. Tell the person asking you that you’ll take it on. Saying “no” the right way makes you more valuable, because it ensures you’re working on important tasks. You’ve carefully and respectfully considered their request. You’ve taken existing requests you’re already working on into account. You’ve made a decision not based on personal whim, but on your best understanding of what is important to your project and organization. Best of all, saying “no” the right way means no evenings or weekends spent working on tasks that don’t really need doing. This site is a collection of writings by developers of Twisted. It is automatically generated from the feeds of contributor's weblogs. If you feel like you should be on here, you're probably right. Assuming that you have something to do with Twisted Matrix Labs, that is. Contact additions@planet.twistedmatrix.com. Please use the Feed Validator to check your RSS feed before sending it in. If you want a custom icon to go with your posts, please send it. It should be no larger than 80x80. We're going with kiddie photos at the moment. Yes, they should be of you! Planet Twisted logo by saph. Run by Ralph Meijer and hosted by ik.nu.